"This is a Cajun-inspired gourmet wild rice dish that I created. It's quick and easy, and can even be cooked unattended in a rice cooker!" 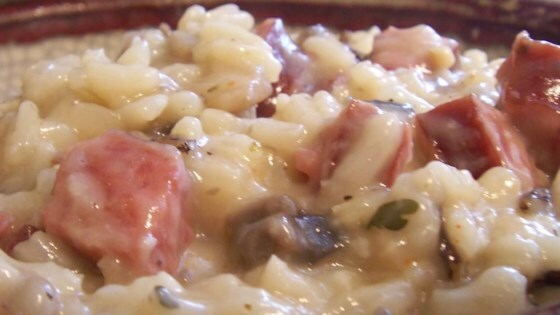 In a saucepan, combine the wild rice, chicken broth, water, sausage, onion, mushrooms and garlic. Bring to a boil, then reduce heat to low, cover, and simmer for 25 to 30 minutes, or until rice is tender. Remove from the heat, and stir in the cream of mushroom soup. It's that easy! This is so very good. I made a homemade cream of mushroom soup instead of canned and used beef sausage because my guest does not eat pork. Fantastic. It couldnt taste much better. Great for healthy eating. I used some moose sausage rather than the requested sausage and it was really good. I love this recipe!!!! It is sooooo easy and the flavor is fantastic!!!! It is worth it if you can find the andouille sausage!! !